"The Diapason is without a doubt the crowning piece of our art. A wisp of an idea expanded over a span of 25 years has culminated into the speaker of my dreams. We humbly dedicate it to the memory of our late friend and mentor A. Stewart Hegeman. The Diapason reveals the enduring impact he has had on our work. We're convinced he was on the right track just like Armstrong, Crosby, Enckel, Olson, Cook, Briggs, and Voight etc, and let's not forget the cosmic elf Buckminster Fuller. Further, I'm certain that my design concepts and conclusions are inspired and invested with a particular sense of the orchestra. For me the great challenge has always been the symphony orchestra. I will not write thousands of words describing my impressions of an orchestra, except to say that it can do almost anything sonically, from a whisper to a roar. In a concert hall this relates to three-dimensional sensations. Why, at home, settle for less? Hegeman understood this aspect of three-dimensional spatial distribution completely as evidenced by his work. The Diapson is a veritable confluence of ideas that reach all the way back to Rice and Kellog. After several years of thought, the first active prototype was built in 1971. A small amount of tinckering followed, and a year or so later it was put away in mothballs to gestate. For 16 years it just nagged away at a corner of my brain and then, in a flash, it just was. The ideas and details came in torrents and the development went at a fever pitch. In about six months we were close to conclusion and I knew we had something quite different and beyond what we had expected. Indulge us but again as we repeat ad nauseum: A conventional, forward-throwing loudspeaker cannot begin to replicate the waveforms produced by natural musical instruments. Nor, for that matter any other sound made in the Universe! Since we must agree that any sound has a polyradial trajectory away from its point of source, we are forced to conclude that a reproductive source, if it is to approximate accuracy, must attempt a similar disposition. A conventional box loud speaker does not even try! It has already failed on the drawing board. Preposterous, you say! Why are there so many of them and only one of us? Don't know ... mystifies us at times ... laws of physics, acoustics, accessible to all ... puzzling. It is now many years since the public showing of the final design, and the consensus of critical opinion is astounding; each owner has described it as his "final speaker!". Many have said they are so absorbed in listening to the music. It has made us delirious with pride and joy. You all know the classic disease of all designers: never happy, never finished! Well, I'm even healing from that one. I've always listened to recorded music with one-half of faculties discerning faults, weaknesses, potential improvements, etc., and the other half trying to enjoy the music. However, with the Diapason I am able to concentrate on the music only. What small imperfections that may exist are insignificant compared to the magnitude of its achievment. The Diapason is simply in a class by itself, and stands apart from previous and present designs in its ability to present the total impact of orchestra, chorus and organ! ("Quite an ego, this Shahinian", you're thinking at this point ... you listen, and decide if it's not true.) With distortion at a vanishing point, frequency response and dynamic range at an awesome level, all requirements have been met. Well, not quite, we tried very hard to make the Diapason invisible ... and failed!. You may of course listen in the dark, which does actually improve illusion and perception. The word "seamless" has been grossly overused and requires clarification as regards a loudspeaker specifically. We know it means without breaks. but that implies "perfect", which is impossible. Fanatic attention was devoted to the character of each of the four stages in the Diapason module. The inspiration came from music rather than a textbook; at the very end of Wlaton's Hindemith Variations there is a ravishing passage consisting of a high pedal on violins, leading to a full brass chord, leading to a full woodwind chord, leading to a full string chord; seamless, absolutely seamless, as each group hands off to the other. The wizardry here, of Szell and the Cleveland Orchestra, has always stunned me and caused me to ponder if anyone could make a loudspeaker do the same thing. I believe we have. A solo speaking or singing voice is also difficult to project as a whole. This, the Diapason does handily. We've chosen appropriate, natural geometry, and we get the reward of exquisite results. It's one thing to use a megaphone outdoors, or aim a horn-type loudspeaker to get the attention of people, where there is an absence of a room or hall to collect and reinforce the sound. It's quite another to bring one's mega-phone into a parlour, to speak with friends. And yet, almost all loudspeakers possess this "megaphone" effect. The entire skin of the Diapason module radiates energy outward, like a spherical, radial point source ... ideal for the purpose. Words and words and more words, and we still haven't told you what a Diapason sounds like. Just as a great chef cannot tell you how his feast is going to taste, the only way to experience it is for yourself. The peculiar personality and character of the Diapason can only be hinted at. My own reaction to all this is rather unexpected. I had never anticipated quite the level, the standard achieved. I feel like saying, as Mozart did about his "Marriage of Figaro" in "Amadeus", "It's the best opera ever written!". Listening to a pair of Diapason's coupled to a reasonable high-power system can be a unique new awesome experience, likened to a live concert. Of course it is still articial; but you won't care anymore. The level of your involvement and concentration will exceed all previous experience. I know whereof I speak; this is not mere propoganda. This is an artistic cultural activity we hope many of you will share. You may imagine my amazement at "colliding"with that elfin wordsmith, J. Gordon Holt, a man who loves digests and writes about music. Over the years I considered it essential to acquire any recording he praised in print. We spent a most magical evening in our exhibit room at a winter C.E.S where we (and a few others) spent three hours listening to music including the whole of Copland's 3rd symphony (Levi, Atlanta, Telarc), ending with applause. For a brief time, we were transported to Symphony Hall Atlanta. It happened ... We were there." The upper module is an asymmetric prism with unequal rakes, fore and aft; and equal rakes, left and right. The entire outer skin of this prism contains 14 seperate loudspeaker, from 5 1/4" miniwoofers all the way to 3/8" supertweeter domes. The electrical distribution is a four-stage brnach of first and third order filters, resulting in a phase correct seamless transition from about 125Hz to 22,000Hz. Four 5 1/4" midrange drivers, two 1 1/2" Titanium dome high midrange drivers, two 3" low tweeters and six 1/2" W-shaped Titanium dome super tweeters. Designed to fit atop the Double Eagle subwoofer. Cabinet constructed of 13-ply Finland Birch, and electrical distribution is four stage branch circuit of first and third order filters for minimum phase function. Dimensions: 22" x 7" x 15 3/4"
We adapted the Shahinian Acoustics Obelisk unique hybrid transmission line bass chamber to a twin back-to-back configuration. The east / west driver position and rear-mounted passive radiators have many advantages and offer a modular flexibility. A single unit can be used with simple passive low-pass filters for a 3-unit satellite-type system, or as an add-on to existing full-range systems to augment the bass and reduce distortion. 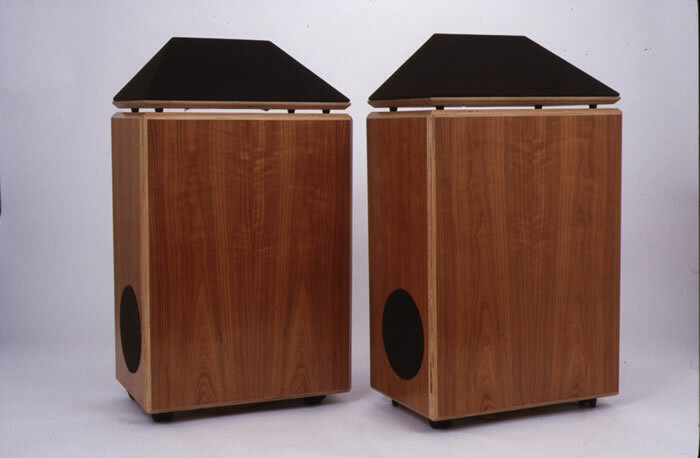 Two units can be bridged to mono, yielding left and right channel dula woofers for even more power handling and lower distortion with a lower 3 dB cutoff. eg with the Diapason Module as in the 'Diapason Ensemble'. Dimensions: 24 1/2" x 16 1/2" x 32"